Feeling they would be the only woman bus driver and wouldn’t fit in. At the end of February 2016, 9.6% of all applications for bus driving jobs came from women. The women they had in post were successfully fulfilling their duties – one in particular celebrated her 30th year as a driver this year – but the challenge was how to dispel the myths, convey a positive message and increase the number of female candidates. As the centerpiece of the strategy, Stagecoach London invited Ferne McCann, of TOWIE and This Morning fame, to join them in at West Ham bus garage to train for her PCV licence. This was shown on national TV on This Morning, and was received widespread coverage across national and local media throughout March 2016. 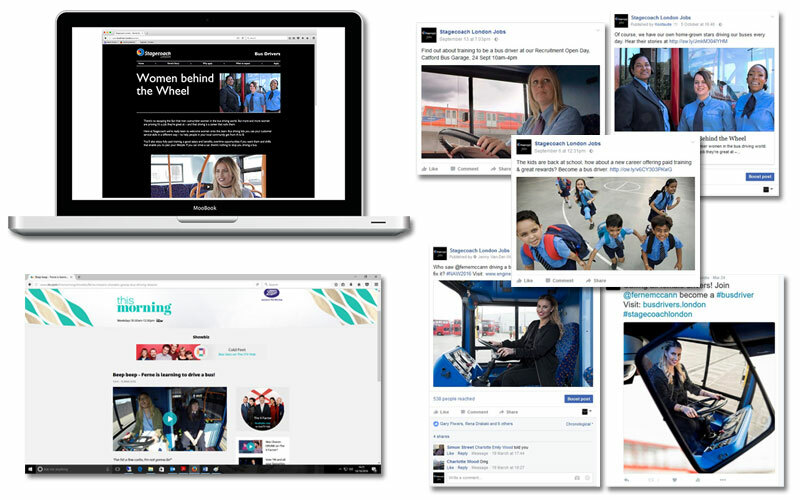 The drive to increase the number of female candidates coincided with the launch of our social media channels for Stagecoach recruitment, and gave the client the ideal material to talk to their growing audience of followers about. The launch on Facebook was also supported by a PPC campaign to help grow the audience faster. Regular posts over the following weeks tied in Ferne’s experiences behind the wheel with broader recruitment activity continuing to present bus driving as a viable career option for women. We also produced two videos in which three female bus drivers shared their experiences; explaining how they got into bus driving, overcoming negativity and their own doubts, and talking about what the job is really like and what it means to them. By the end of March 2016, Stagecoach had seen an increase in applications from women by approximately 30%, growing from 9.6% in February up to 12.5% of all applications (2,189). Since the launch of Stagecoach London’s social media activity in March 2016, the number of female followers has grown from 28% at the end of March, up to 33% at the end of September. Finally, at the end of February 2016, Stagecoach had 292 female bus drivers. In mid-October 2016, this number had grown to 331. As well as being highly successful in terms of the campaign, we were also delighted to win the Best Diversity and Inclusion initiatives at the prestigious RAD awards and to be Highly Commended in the RMA/CIPD awards as well.